Actually, Google’s not the only search engine that hates you, but it’s probably the only one that matters since it owns roughly 70 percent of the U.S. search market. Anyone who has attempted to run an SEO project is aware by now that Google changes things … a lot. So often, in fact, that we’re sometimes left questioning whether or not Google really has its users’ best interests in mind. One such example of this happened just within the past few weeks, when Google decided that they would no longer allow full access to their keyword statistics. Nope, now a keyword has to be deemed “commercial” in nature (whatever that means) by Google’s algorithm before you can view search statistics for said keyword. I find this to be amazingly ironic since Google is one of the biggest proponents of leveraging statistical analysis (Google Analytics, anyone?) to better target high-converting visitors who are actually looking for your products, services or information (pay attention there, Google), rather than just bringing bulks of random people to your site. And we’re supposed to rely on these metrics? It’s important to understand that Google’s real concern is probably that of any typical business: how they’re going to continue to grow profits. Because Google’s profits grow the most when their users spend on PPC, Google has marketed conversion rate optimization (CRO) heavily over the past few years by rolling out resources like two different CRO testing platforms – the Conversion Optimizer and Website Optimizer – in conjunction with the “Improving Online Conversions For Dummies” book, explaining how to use the Google adWords tool, and conference and tradeshow presentations, white papers on the topic and a ton more. When you stop to think about it, the focus on conversion optimization actually makes a lot of sense. Just not necessarily at the cost of neglecting other marketing opportunities like SEO. What good are your visitors without conversions? Conversely, what good is a dialed-in sales-machine of a site without any visitors? You need both if you want to win. In this author’s opinion, Internet marketing works more realistically like this: SEO, PPC and other marketing efforts drive traffic to your site. That inevitably leads to some conversions. Next, you use conversion optimization to improve your conversion rate, which eventually leads to a larger spend on marketing such as SEO and/or PPC (but perhaps not as much spend on PPC in this particular model). And the rainbow-happy cycle continues, unless you live in a giant cloud like big Googs. Any entity that purports to limit the scope of methods that you can use to drive relevant traffic to a website is also doing harm to your ability to improve conversions. If you are only ever able to access a small portion of the people that are looking for your site, then you are not able to account for all of the persona types that might want to visit your site but simply can’t find it. This holds especially true when one considers the fact that search engine users experience a much different cognitive reaction to PPC ads than organic search results. With a PPC ad, visitors expect that they are being sold something. But organic results do not necessarily imply that. For instance, I tend to have a humanistic (emotional) type of personality profile, and will never click on a PPC ad, regardless of whether I’m actually looking for that service/product or not. That’s because humanistic people don’t want to feel as if they are being sold something; instead, I want to develop a relationship on my own terms. The only time a PPC ad will be effective on someone like me is via an accidental click, when I don’t realize that I just clicked an ad. So, by choosing to only do PPC or only do SEO, you are also choosing to neglect some potential customers and definitely neglecting certain consumer modalities. This is what I believe to be the fundamental flaw with Google’s push away from SEO and toward PPC. Here’s some advice: ignore the man behind the curtain and optimize the crap out of your site. Your bottom-line will thank you for it. Google is smart very smart, the 900 pound gorilla strikes again. They own the system so make the rules,if their bottom line is threatened then they will do what is right for Google not for everyone else. I really feel that the turning point for Google was going public. Now, like most American corporations they must look to bottom line each month… what’s best for the stockholder, rather than what’s best for their customers. Let’s see how long their slide into mediocrity takes. Keyword tools are valuable when you are starting out. But for an established website, the stats are much better. They will show much better keywords and you can track click path and conversions. The problem is, watching the stats is boring tedious work. Thats why we are developing a better system for that. But stats are one of the secrets of success. Good article. Google is a beast hungry for more profits! Hopefully they will get some better competition from Bing and Yahoo to keep them honest. Everyone should have a chance to compete through SEO if they can produce great, relevant content for their audience. We used quartz crystal, Chris. The inventor of sunlight only wears the best timepieces. So how long did it take — you know to invent sunlight? you are right for SEO, only, expectations can get quite high if you take already built site with great traffic. Than in SEO comes the mastery of optimizing that traffic and getting higher, especially with the use of tools like MajesticSEO and SEOs know-how and expertise where the website is thin with keywords. 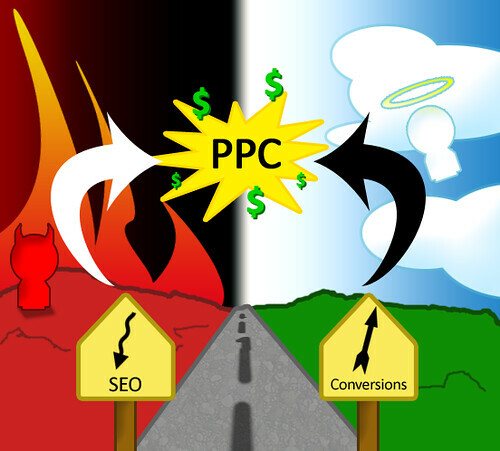 I agree with you about PPC being primarily useful for salesy, commercial keywords. That suits user expectation for PPC advertising. SEO on the other hand has no set expectation one way or the other, so it can perform under nearly all circumstances if executed correctly. I’ve been doing PPC for some time and I’ve seen that in competitive industries PPC does not work. Users randomly click on the ad and compare the offers, which leaves you behind in spending. ROI on these campaigns was good, but nothing compared to SEO. So I spent much more time doing CRO, and the results were far better. Google knows it, so that’s why they introduced the “buying cycle” CTR metric in AdWords. My opinion is that you should only be doing PPC for “sales keywords”. Branding and generic traffic (for product/category keywords) should be done only if you want to get larger market share on the long run. Thanks Nucky. How’s liquor sales treatin’ ya? I don’t know about this google stuff, but way to go on inventing sunlight! That was a great idea… hard to top that one. I feel your pain Adam! Granted they are clearly making some ‘adjustments’ and fine-tuning, but there’s much still left to be desired. Levi, you have a good point. Google may be very aware of the benefits of organic and just not want anyone to take advantage of those benefits. What I hoped to point out in this article was that they are probably shooting themselves in the foot by taking that stance. For the most part I agree with what you’re saying except for the fact that I feel Google knows the value of organic, they just hate it. If they didn’t know of its value, they wouldn’t be messing with it so much. They wouldn’t go through the trouble of stealing content to put on their places pages. They wouldn’t go through the trouble of driving local traffic so hard. 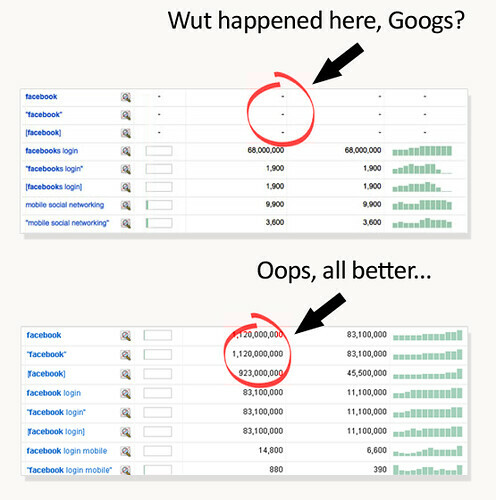 Google’s older Keyword Research tool was far more useful. I could do all the PPC and SEO keyword research in minutes for most Websites. I wonder what makes a keyword “commercial”? Is it the fact someone is bidding on it, or it has received PPC clicks?